MEDPREP offers a nursing assistant-certification preparatory program of no less than 85 training hours of coverage in theory, skills practice labs and clinical internship at a healthcare facility to assist the student to become successful when taking the Washington State written and manual testing to become a Nursing Assistant-Certified. Upon registration an assessment is given to each student to evaluate their ability to read, write & comprehend the English language. Class time and skills practice labs will be held for no less than 38 hours at the school location and the clinical internship of 50 hours of which 38 hours will be completed at an affiliated healthcare facility. Open enrollment is available throughout the year. The student must plan on attendance to all training hours as well as participate in topic discussions, demonstrations, and be able to re-demonstrate all testable skills in basic resident care. Student achievement is evaluated by use of written testing including a comprehensive final. A minimum of 80 percent is required to pass and the student must be able to demonstrate all of the state-testable practical skills to complete the program successfully. One retest per test will be allowed in class. Students are further encouraged to return for additional skills practice lab time to assist in achieving success at the testing for licensing to become certified as a nursing assistant. Located at 1830 Broadway, Everett, Washington, 98201 that includes a welcoming foyer with guest seating and table for completing paperwork as well as a large classroom, flat screen television, overhead projection, multiple videos, and three complete patient care areas including semi-electrical beds, over-the-bed tables, nightstands, privacy curtains and all necessary supplies to care for patients with hoyer lifts and wheelchairs at the foot of each bed. There are also examination tables used by students for state testable skills practice as well as a mini-kitchen with refrigerator and microwave. All areas are secured by use of surveillance cameras and a rear exit for emergency use. There are multiple sinks in the school and portable equipment for student use including a resident commode, dirty personal care item rack, and a doctor's balance-weight scale. Additional personal care item supplies including bed linens and bathing supplies are in covered & zippered storage shelving. Student records are archived at the end of each year and duplicating can be done at time of request. All archives are also placed on a CD for storage for fifty years in compliance with Washington State requirements. Any retrieval from archives for a student will be done in a timely manner but staff can take up to thirty days in accordance to work and training schedule. All duplicating will incur a duplicating charge. The school is licensed under Chapter 28C.10. Inquiries or complaints regarding this private vocational school may be made to the Workforce Training & Education Coordinating Board, located at 128 Tenth Ave. SW, Olympia, WA. 98504-3105, or by calling (425) 257-9888. The nursing assistant training manual has been approved by the WTECB, the Department of Health-Nursing Commission (DOH), and the Department of Social & Health Services (DSHS). Ms. Pat Stickles RN has been a healthcare educator since 1991. Her nursing career both preceded and continued after the opening of the MEDPREP school with extensive experience in psychiatric, rehabilitative, hospital and long-term care nursing. She is the sole proprietor and opened the MEDPREP Training Center in 2001 after teaching the Nursing 100 course at Everett Community College for almost five years. In addition to teaching groups of students, Pat has been an educational consultant to many facilities or has authored training programs for them. At one time she was the Regional Training Director for a national healthcare corporation and had a training site in the Northgate/Seattle region taking care of either the nursing assistant training or the facilities pre-survey quality assurance visits to their nine nursing homes in the Seattle, Bellevue, Kirkland, Mercer Island & Renton area. Pat has also been the owner and test rater for the current Washington State testing company and believes in a positive learning environment and is dedicated to the success of every student. With the assistance from her educational team MEDPREP has trained greater than 5,000 students who are now quality care providers as nursing assistants, LPN's and RN's in the community. 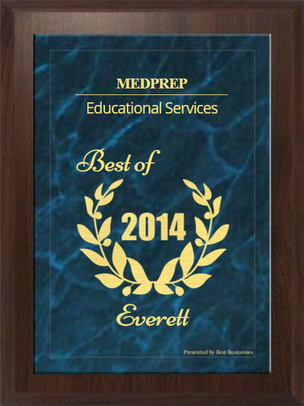 Everett, December 23, 2014 -- MEDPREP has been selected for the 2014 Best Businesses of Everett Award in the Educational Services category by the Best Businesses of Everett Award Program. Each year, the Best Businesses of Everett Award Program identifies companies that we believe have achieved exceptional marketing success in their local community and business category. These are local companies that enhance the positive image of small business through service to their customers and our community. These exceptional companies help make the Everett area a great place to live, work and play. Various sources of information were gathered and analyzed to choose the winners in each category. The 2014 Best Businesses of Everett Award Program focuses on quality, not quantity. Winners are determined based on the information gathered both internally by the Best Businesses of Everett Award Program and data provided by third parties. The Best Businesses of Everett Award Program is an annual awards program honoring the achievements and accomplishments of local businesses throughout the Everett area. Recognition is given to those companies that have shown the ability to use their best practices and implemented programs to generate competitive advantages and long-term value. The Best Businesses of Everett Award Program was established to recognize the best of local businesses in our community. Our organization works exclusively with local business owners, trade groups, professional associations and other business advertising and marketing groups. Our mission is to recognize the small business community's contributions to the U.S. economy.